GENEVA, Jan 16 2018 - IOM, the UN Migration Agency, reports that 1,916 migrants and refugees entered Europe by sea through 14 January. This compares with 3,046 coming ashore during a similar period in 2017. IOM Italy’s Flavio Di Giacomo reported Monday (15 January) that last Thursday IOM learned that 263 migrants were rescued from a sailing ship of unknown registry and taken to the port of Crotone in Calabria, Italy. IOM staff had the opportunity to speak with the disembarking migrants, who were mainly Pakistani, Iraqi, Syrian and Afghan. According to their testimony, these migrants left Antalya, Turkey on a sailboat on 6 January, led by a smuggler of Russian nationality. Each paid from USD 5,000 to USD 12,000 for the trip, sums paid by their families. Many said they had relatives in France, Germany, Great Britain, among other places. These witnesses said the smuggler threatened them with a firearm until he abandoned the boat after two days of navigation. When the sailboat encountered a storm, it began to take on water and became unstable. Three days out, the migrants, in a state of great agitation and fear, called for rescue, which arrived through the Italian Coast Guard and Guardia di Finanza patrol boats. “As strange as it may seem, it is not the first time that we have recorded the arrival of a sailboat with migrants leaving from Turkey,” explained Federico Soda, Director of the IOM Coordination Office for the Mediterranean. 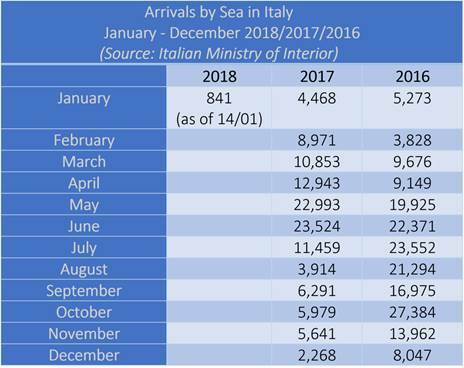 The 841 arrivals to Italy through Sunday (14 January) is about one-third the total (2,355) arriving by this time last year. Since the end of June of 2017, Libya-to-Italy voyages have shown a marked decline, although fatalities on the Mediterranean’s Central Route remain high. 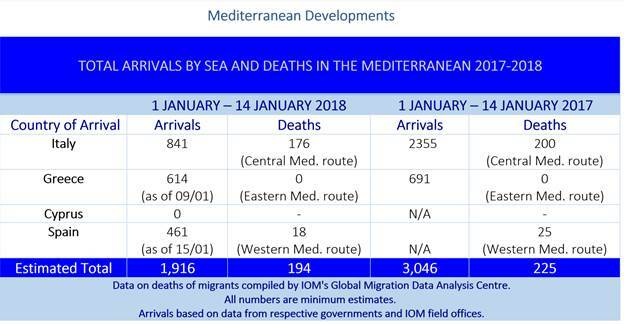 IOM’s Missing Migrants Project records 176 deaths on this route in 2018, compared with 200 at this time last winter (see chart below). Italy and Greece arrivals this year continue a trend that began in 2017, when migrant arrivals along the Mediterranean Sea’s Central and Eastern routes hit their lowest levels in four years (see chart below). IOM’s Missing Migrants Project (MMP) in Berlin reported that in the Western Mediterranean the remains of two migrants were found at different locations off the coast of Algeria: on 12 January, local fishermen found a body entangled in their fishing nets near Mostaganem. He was identified as a 23-year-old local resident of the town of Abdelmalek Ramdane, and he had been reported as missing by his family since he attempted to cross to Spain two months earlier. On 13 January, another body washed up in Zemmouri El Bahri beach, near Boumerdès in Algeria. Eighteen migrants have lost their lives in the Western Mediterranean since the beginning of the year, compared with 25 fatalities recorded in these waters during the first two weeks of 2017. 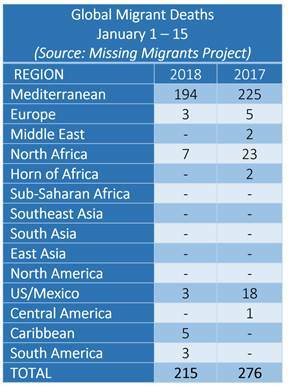 Worldwide, the Missing Migrants Project has recorded the deaths of 215 people during migration in the first two weeks of 2018. This compares to 276 at this time last year (see chart below). Beside the two new Mediterranean deaths, seven migrants died trying to reach Spain’s Canary Islands from North Africa on 15 January: the Spanish Maritime Safety Agency reported five bodies were found in a large rubber boat near the island of Lanzarote. Another two migrants who were retrieved from the sea died later. Twenty migrants made it to the shore; two of those have been hospitalized with signs of hypothermia. Two fatal incidents were recorded in Europe in recent days: on 11 January, a 26-year-old Afghan man was hit by a vehicle in the A14 motorway near Castel San Pietro in Bologna, Italy. On 14 January, a 28-year-old Gambian man died after being electrocuted on the roof of a train travelling from Ventimiglia in northern Italy to Menton, France. In the Caribbean, the death toll from last week’s (10 January) shipwreck of a small motorboat carrying migrants from Venezuela to the coast of Curacao rose to five, after the body of another Venezuelan migrant was found last Friday, 12 January. Local authorities said they had accounted for 16 survivors of the shipwreck.